AP/Paul Vernon, Charlie Neibergall, Paul VernonFrom left Sen. Rand Paul, R-Ky., U.S. Sen. Ted Cruz, R-Texas and former Arkansas Gov. Mike Huckabee are seen in file photos. Now that last week’s midterms are over, 2016 is the next major election cycle on the calendar and the race for the White House seems to have taken off in earnest. A trio of leading potential Republican candidates’ campaigns revealed high-profile steps they have taken towards launching their presidential bids on Wednesday. According to multiple reports published Wednesday, Arkansas Gov. 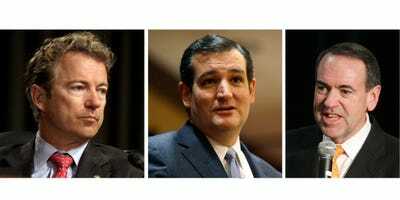 Mike Huckabee (R), Sen. Ted Cruz (R-Texas), and Sen. Rand Paul (R) are all quickly moving forward with their plans for the elections in some form or another, even though voters in Iowa won’t cast their ballots for at least a year. Early in the morning, The Washington Post detailed Huckabee’s efforts to reconnect with supporters six years after his unsuccessful 2008 White House bid. Huckabee is reportedly doing several things to lay the groundwork for a campaign. He’s planning his reintroduction to key fund-raisers over the next few months, he’s keeping his 2008 campaign advisers close, and he’s receiving encouragement from his family. The Post article also noted Huckabee’s allies commissioned polls in early primary states that they claim found him leading the GOP pack by double digits. “There were polls done that surprised me and got my attention — and led my friends to urge me to think of this again,” Huckabee said. Meanwhile, Politico’s Mike Allen reported Paul was set to huddle with his core political advisers on Wednesday “to plan ahead for a likely presidential campaign.” Allen gave Paul a 90% chance of ultimately launching a White House bid, even though the senator publicly insists he is still making up his mind. “Doug Stafford, executive director of RAND PAC, will sketch the tentative plans. Separate sessions will cover finance, politics and communications. Participants look at this as the kickoff of a great adventure, where they’re likely to be working shoulder-to-shoulder on a gruelling national campaign. In later afternoon, the senator will join to pump up his troops, and will stay for a celebratory dinner,” Allen wrote in his morning newsletter. Supporters of Cruz, a conservative firebrand, also revealed their plans on Wednesday for a so-called super PAC supporting his candidacy. However, not every Republican is rushing towards the campaign trail. Texas Gov. Rick Perry (R) surprised many observers on Monday when he said he wouldn’t make an official decision whether or not to run for president again until May — at the soonest. On the Democratic side, front-runner Hillary Clinton said in September that she would make a decision by Jan. 1, 2015. However, in October, the New York Times reported a Republican Senate takeover could prompt Clinton to launch her official exploratory committee before the end of the year. That report cited sources close to Clinton who said the Democratic party might “need to quickly pivot to the presidential campaign” if the midterms went badly. Of course, last week’s elections were a drubbing for Democrats with Republicans gaining control of the Senate and winning downballot races by much higher than expected margins. In other words, on both sides of the aisle, it looks like the presidential campaign is about to be in full swing.